I communicate vintage style in small bits. This week the discussion of Hidden Art of Homemaking is on chapter 9 – Writing Prose and Poetry. I haven’t kept up with the conversation at Ordo Amoris for a week or more, and for this chapter I’m just re-posting this from August 2009. Don’t be misled by the now-obsolete references to postage rates! To introduce the postal theme– and for a few moments just forget about the concept of mail that can’t be carried in from the mail box in one’s real hands–I show you this T-shirt we bought in Yosemite last month, at the post office. It was the best clothing deal in the park, and an unusual and historic design: a reproduction of a stamp that was issued in 1936, showing–Yes! my beloved El Capitan! If you have ever beheld that rock I trust you won’t find its frequent appearance here tiresome. 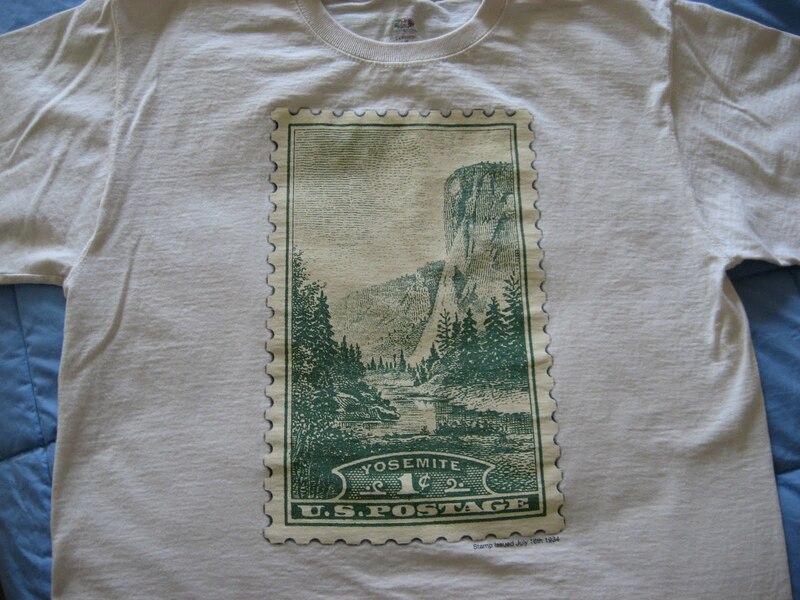 I mostly wanted to tell about postcard-writing, and the shirt isn’t very pertinent to that…though it just occurred to me that one might buy the shirt at the Yosemite post office and then write a postcard sort of message on the fabric before mailing it in its more personalized form. I don’t think I’ll run right back there and pick up a few more, though. When I was a child, my maternal grandmother would send postcards to me and my siblings from wherever she was traveling. I recall receiving word from Turkey, Norway, Mexico, and Hawaii. She also wrote very entertaining letters from home. As she has been a major role model for me, it’s no wonder that I feel it a natural activity as a human being to share my life in this way with those I love. It’s easy when on a journey, away from the usual housekeeping duties, to remember friends and family and take the opportunity to let them know I do think of them. A trip just doesn’t satisfy if I haven’t dropped a dozen cards in the letter-box. This picture was taken at the Grand Canyon. 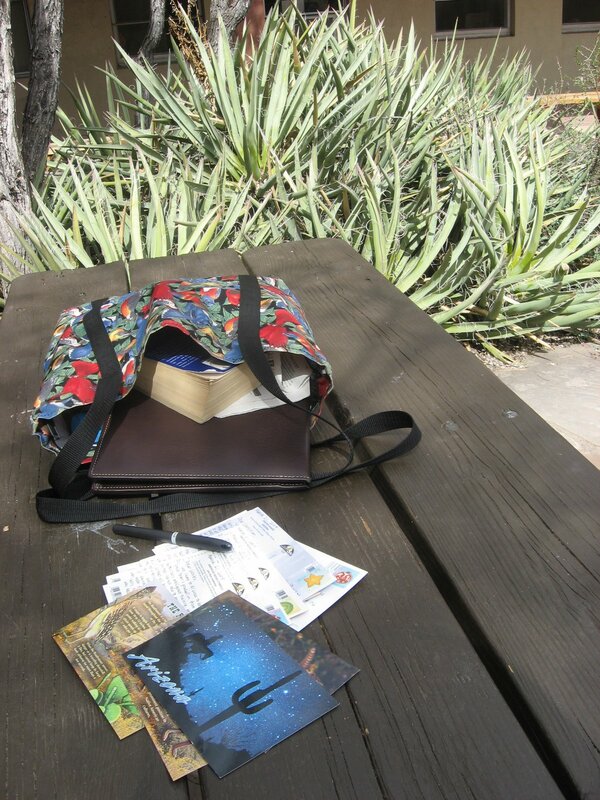 When others in our party were hiking down into the gorge one morning, I walked all over the place looking for a picnic table with a view, from which I might write my cards. That was not to be found, but in a sheltered courtyard I did find a good spot, away from wind and next to a big stone with rain water pooled in a depression on the top. I didn’t notice this rock until I was startled by a raven who swooped down to drink. Postage “just” went up again. It now costs 28 cents to mail a postcard. 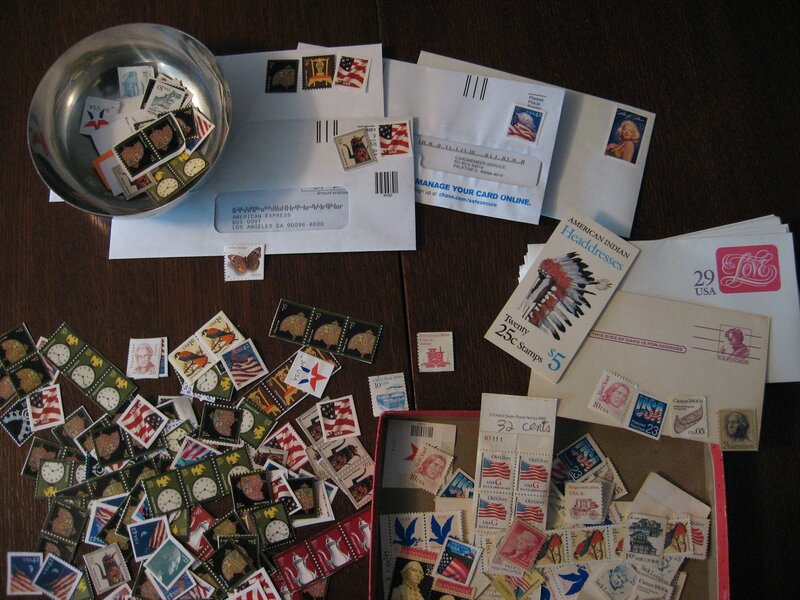 On those first envelopes carrying my grandmother’s address in the corner, the stamps on the other corner said “4 cents.” I can’t imagine that a postcard was more than a penny. One thing I inherited from my father recently was the stamps from his desk drawer. There are some pretty old ones, from when a letter was 25 cents. If they still have stickum on them I use that, and if not, I apply a little Elmer’s glue and save my pennies by using these old stamps. I also “inherit” stamps from my father-in-law, who gets them (less and less, now that he responds infrequently) from charitable organizations that want him to send donations. They come to him already sticking to envelopes, but I cut them off and glue them on to our own bill payments. Some of my collection are in the photograph above. If you want to see the stamps up close, just click on the picture and you can see an enlarged version. In California it seems that every town is a tourist town. At least, I find postcards in all the stores. But in some locales, the market has yet to be discovered, and I have to make my own postcards, which I learned to do from Martha Stewart, who gives us this handy template and instructions for using it. I’ve made these one-of-a-kind cards with photos of someone’s backyard, or a lake that is small and unknown, or a town that is seemingly too plain for the professional postcard people. But why restrict this fun habit to traveling days? I started sending postcards to the grandchildren and friends any old time. A postcard is small enough that I can find time to write a few words while the iron or computer is warming up or perhaps even in the middle of the night when sleep won’t come. I don’t think old-fashioned correspondence of this sort will ever become obsolete or unwelcome. This is a wonderful post! Snail mail is so precious these days and postcards are a great answer. I picked up 2 last weekend to send to a couple of my blog buddies because although this comment box is fun… the mailbox is more so!! Handwritten hellos will certainly never become unwelcome! Such a cute post…. It is rather amazing to look back at the archives at the treasures you have produced, isn't it? I like you pulling them out again too. What a terrific idea. I have started using Shutterfly to make cards and gifts with photographs for family and friends. I just sent a thank-you note with pictures from a visit I had with an old friend. Maybe this would be the thing I am looking to do for my grandchildren to make them feel special. Thanks so much!! what a lovely legacy your grandmother left you…travel via post cards. I thought I was the only one who cute stamps off return envelopes and glued them to other envelopes! There's nothing better than walking to the mailbox and finding a letter or postcard! I love your idea of mailing homemade postcards to loved ones. I'm doing it today! Thanks. I love receiving post cards from around the world. What a great idea to start this tradition with my own grandchildren, small though they be at the moment. A lovely post.